Nikki joined the Hero Dogs staff in May 2018. Prior to that, she co-founded and worked as a co-executive director at Network for Victim Recovery of DC (NVRDC), a comprehensive crime victim services organization serving Washington, DC, for six years. In that capacity, she oversaw operations, advocacy, case management and therapeutic support for victims of all crime types, including a 24-hour on call sexual assault crisis response team. She is passionate about helping those who experienced trauma recover using the most progressive and effective treatments and programs available. Prior to founding NVRDC, she was the Administrator of Victim Services for the Criminal Injuries Compensation Board in Maryland. She has received two Governor’s Citations for Excellence in Victim Services. Under her leadership, NVRDC’s case management team was honored with a Navy Award of Group Merit, for NVRDC’s response to the 2013 mass shooting at the Navy Yard. She was also a full time faculty member at American Military University for a decade. She is a master’s level trained grief counselor who received her B.S. from Shepherd College and her M.A. from Hood College. Joanne joined Hero Dogs in January 2019. For ten years, Joanne was Executive Director of Institutional Advancement at Bullis School (Potomac, MD), where she oversaw all fundraising, marketing, communications, events and alumni initiatives, including the school’s recent $27M capital campaign. Joanne has over 30 years of experience in independent schools, having served in numerous administrative capacities throughout her career—including athletic director, dean of students, upper school principal and head of school. Joanne’s alter ego has always yearned for a job with animals—even though born in the city and without a horse of her own, she realized her dream of achieving a degree in equestrian studies. She has always had rescue dogs and cats, and her current white boxer mix, Blizzard, is a certified therapy dog and does agility (not very quickly but she is “doggedly” determined!). 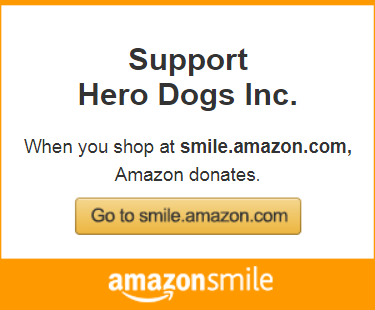 Joanne is thrilled to help bring resources to Hero Dogs and to support its mission. Joanne received her B.A. from Lake Erie College and her M.A. from Kent State University. James joined the Hero Dogs staff as Administrative Assistant in September 2012, becoming the organization’s first hired staff member, after ten years of working in administrative jobs at other organizations. He was thrilled to find a position where he could support an organization that works to help those in need, and delighted to find himself in an office where canines frequently outnumber humans. He and his wife, Jessica (a Hero Dogs volunteer) live near Frederick, MD with four cats (Heidi, Cubby, Moses, and Penny) and two rabbits (Coriander and Chinchilla (who is not a chinchilla)). The dog he borrowed for the picture is his absolute favorite Hero Dogs, Teddy, although just about every Hero Dog is also his absolute favorite Hero Dog. Sarah joined the Hero Dogs staff in 2019. She is excited to be able to incorporate her love of dogs into her career in a way that helps people. Previously she was the Events Coordinator at Labyrinth Games and Puzzles, and before that she worked in radio for more than a decade. If you ever want to have a conversation about a relatively obscure topic like Bollywood, murder mysteries, or 1970s television, Sarah’s your gal. Jennifer is a former research scientist with experience at the University of Michigan, Medtronic Inc., and IBM. She specialized in neural prostheses – electrode arrays implanted in the brain to control prosthetic devices such as an artificial eye, ear, or limb. Her research interests coupled with her love for dogs led Jennifer to start Hero Dogs, Inc. She is passionate about providing service dogs to people who deserve them most but often go unnoticed: our nation’s Veterans with disabilities. 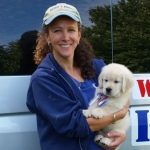 Jennifer is a “dog expert” having raised and trained dogs all her life, including assistance dogs for Leader Dogs for the Blind and Guiding Eyes for the Blind, Inc., and canines for the Connecticut State Police. Other previous experience includes certification by the Certification Council for Professional Dog Trainers; ownership and operation of a highly successful dog agility and obedience business in Montgomery County, MD; serving as an instructor for Kutztown University’s Level II Canine Training and Management Program; membership in the Association of Pet Dog Trainers; and service on the Board of Directors for the Massachusetts Institute of Technology (MIT). 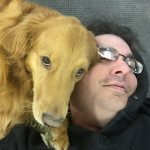 Mike joined the Hero Dogs staff as the Director of Applicant and Client Services in March 2018. He has extensive experience as a licensed clinician in mental health and substance abuse services and has served in the military in both the United States Air Force and the Maryland Army National Guard. Mike is originally from New York City but has lived many places because of his military career. He has been a program director in various mental health programs in a variety of behavioral health settings. He has a B.S. from the University of Maryland in Psychology, a MAED in Counseling from Northern Arizona University, a M.A. from West Virginia Graduate College (now Marshall University Graduate College) in Diagnosis and Intervention, and a M.DIV. from Liberty University in Military Chaplaincy. He has volunteered with a number of organizations such as the Howard County Police Department, Team River Runner, and Team RWB. Becca, a native of upstate New York, is a graduate of SUNY Cobleskill in Animal Science. 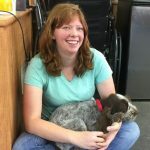 She is a certified dog trainer, CPDT-KA, who first came to Hero Dogs in January 2012 to do her senior year internship. 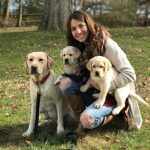 As an intern, she supervised the kennel volunteers, cared for the four dogs then at the facility, assisted with classes, and learned new service dog training skills. After graduating in May 2012, Becca took a position at a local animal shelter. However, she missed the Hero Dogs she had spent four months living with too much, and she returned to Hero Dogs that fall as our Kennel Manager. 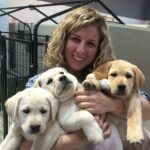 In June 2018, Becca handed off the Kennel Manager duties to Sabrina and became a full-time trainer dedicating her time to working with the advanced training of dogs at our facility, puppies still with their puppy raisers, and Hero Dogs Teams. Having previous experience as a volunteer instructor at a therapeutic riding program, Becca enjoys coming to work every day on a horse farm, and sometimes tries to sneak extra cats into the kennel. After volunteering for nearly a year, Sabrina joined the Hero Dogs staff as a Training Program Intern in January of 2018; she is now the Kennel Manager. Sabrina recently graduated from Towson University, majoring in psychology and animal behavior. 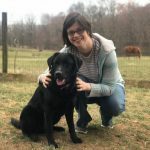 While continuing to learn about service dogs and training, as well as other aspects of working at a nonprofit, Sabina will be doing all of the training, scheduling, and day-to-day supervision of kennel volunteers, as well as keeping the kennel operating smoothly. Sabrina lives with a Flat Coated Retriever named Lucky. 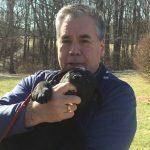 Gary moved to Maryland a few years ago and was looking for a way to give back to the community. He first joined Hero Dogs as a volunteer in 2017. He and his wife, Meaghan Richmond, raised Hero Dogs Jaz and they are now raising Hero Dogs Derby. Gary has a background in Chemistry, Mathematics, and Computer Science but has decided that puppies are much more fun. 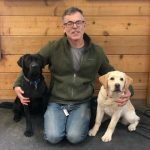 Gary is in charge of connecting volunteers with their interests and in the day to day administration and automation of the Hero Dogs puppy program. He lives in Damascus, MD along with a cat and three chickens and loves coming to work.